Fellow Svengoolie SvenPals and fellow Universal Studios monster aficionados will be jumping for joy for Sven’s upcoming showcase of a classic werewolf thriller. 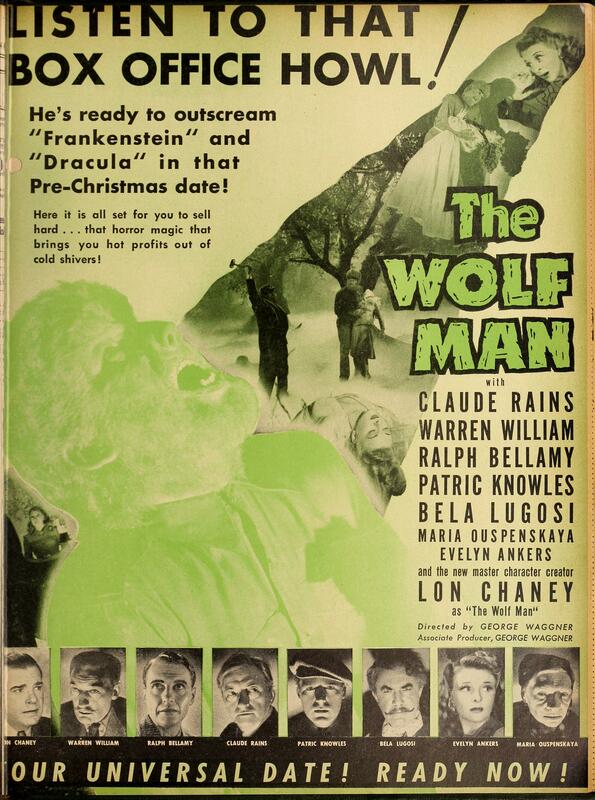 Realart Pictures re-issue trailer for Universal Studios‘ “The Wolf Man” (1941). The iconic Berwyn/Chicago-based horror film host will be showcasing the Universal Studios werewolf monster thriller classic, “The Wolf Man” (1941); this Sat., Aug. 11 at 8 p.m. Eastern/7 p.m. Central on Me-TV. “The Wolf Man” (1941) was directed by veteran film director George Waggner. Waggner later worked in the field of television in his directorial career, notably directing several episodes of the live-action “Batman” TV series with Adam West and Burt Ward from 1966-67. The inspiration for “The Wolf Man” came from Universal’s earlier werewolf thriller entry, “Werewolf of London” (1935, directed by Stuart Walker; with Henry Hull, Warner Oland, Spring Byington, Valerie Hobson and Lawrence Grant). This will mark Sven’s sixth big broadcast of Waggner’s Universal werewolf monster feature on Me-TV. He had previously showcased “The Wolf Man” (1941) back in Feb. 2013, July 2013, Oct. 2014, Feb. 2016 and Sept. 2017. The players who appeared in Waggner’s Universal werewolf monster thriller were Lon Chaney Jr. (in the dual role of Lawrence “Larry” Talbot/the “Wolf Man,” the junior Chaney was credited as “Lon Chaney” in Waggner’s feature), Claude Rains (as Sir John Talbot), Bela Lugosi (as Bela), Evelyn Ankers (as Gwen Conliffe), Ralph Bellamy (as Colonel Montford), Warren William (as Dr. Lloyd), Maria Ouspenskaya (as Maleva), Patric Knowles (as Frank Andrews), Fay Helm (as Jenny), J.M. Kerrigan (as Charles Conliffe) and Forrester Harvey (as Twiddle).